“Experience should teach us to be most on our guard to protect liberty when the Government’s purposes are beneficent. Men born to freedom are naturally alert to repel invasion of their liberty by evil-minded rulers. The greatest dangers to liberty lurk in insidious encroachment by men of zeal, well-meaning but without understanding. Author: Mark Grannis. 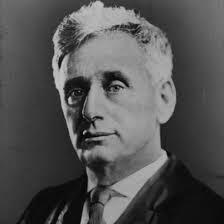 This entry was posted in Liberty QOTD and tagged beneficent tyranny, civil liberties, greatest dangers to liberty, Louis D. Brandeis.